OU PGCET 2018 Time Table Download, OUCET 2018 Time Table: #OUCET Exams Time Table 2018,OU PGCET Entrance Tests 2018 #TimeTable released and download it. Osmania University, Directorate of Admissions, Hyderabad would issued the PG Common Entrance Test 2018 Notification in April, 2018 for the academic year 2018-2019. OU PGCET 2018 for Admission into various post graduation courses, PG Diploma courses and 5 years Integrated courses in the Osmania, Telangana, Mahatma Gandhi and Palamuru University in the campus, constituent and affiliated colleges for the academic year 2018-2019. Osmania University would invite the online applications from eligible candidates through its official web portal as per schedule for appearing the entrance tests. Hall Tickets of OU PG Entrance 2018 will be uploaded on web portal and the downloadable hall tickets for entrance tests will be made available in it web portals. The candidates have to download the hall tickets to appear in the entrance tests. No hall tickets will be sent to candidates by post. 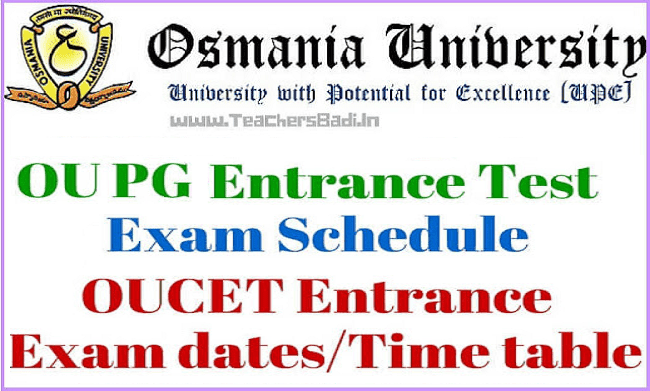 The Osmania University will conduct the OU PG Entrance Tests 2018 from as per schedule and the time table of these tests would be placed on OU Web portals. Candidate can download the time table. 1.The candidates are advised to download the Hall Tickets, without which they will not be allowed for entrance tests. Further, the candidates are required to affix a passport size photograph on the space provided in the hall ticket. There is no m.sc statistics entrance xam .. Y sir ?? When it will be..?